Of course the MeltCupTM is less expensive than your current QuickCup® ! 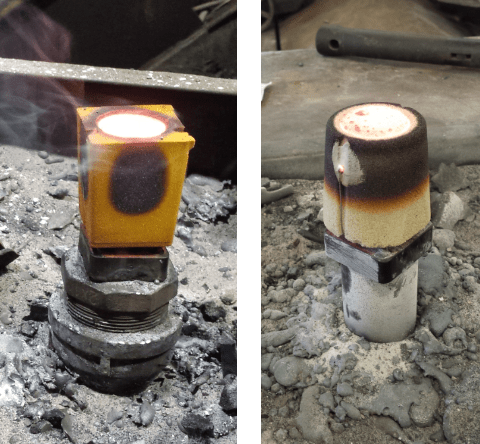 Still for your iron metallurgy control, this article summarizes why the MeltCup by MeltLabTM Systems wins as the best thermal analysis cup on the market. Figure 1 : QuickCup (left) and MeltCup (right) in action. 1. Improved tellurium addition: MeltCup got rid of the Sodium Silicate (Waterglass) in the tellurium mixture ( still used in QuickCup ). It is a source of hydroscopic water which boils away chemistry just like the old-time green poling did, if you can remember. No need for the bentonite either that has been used for a long time in the tellurium mixture. During your demo with us at your foundry, you’ll understand what’s the best way to add tellurium. 2. Cost-effective sand material: Meltcup use Isocure/Pepset instead of shell sand like QuickCup. It contributes to make MeltCup less expensive and has half the resin content of the QuickCup. Sure its shelf life is only 2-3 years in storage, but how long do you really need? Both cups don’t disintegrate during measurements unlike, as you can remember, the old all-squared version of the QuickCup. 3. Better shape: The shape and diameter of the MeltCup favors being short and squat rather than tall and lean. You want the center of the heat to be at the center of the thermocouple, not off center. 4. Thermocouple properties control: If you ever tested thermocouples from different lots, there are going to be slight differences from one lot of thermocouple wire to another ( for instance, thermocouple wire alloy properties are not exactly the same from one batch to another ). Both QuickCup and MeltCup use “special limits” wire which is within 1 degree C of nominal. That one degree can translate into 1 point of Carbon difference and 3 points of silicon difference. When buying several boxes of cups at a time, MeltCup will always send you boxes from the same lot of wire. With QuickCup, you may need to specify every single lot or your castings will suffer the differences. 5. No boiling : Because the cup doesn’t spit out like the QuickCup, you can properly fill the MeltCup to the top. This puts the thermocouple in the right place for maximum accuracy. 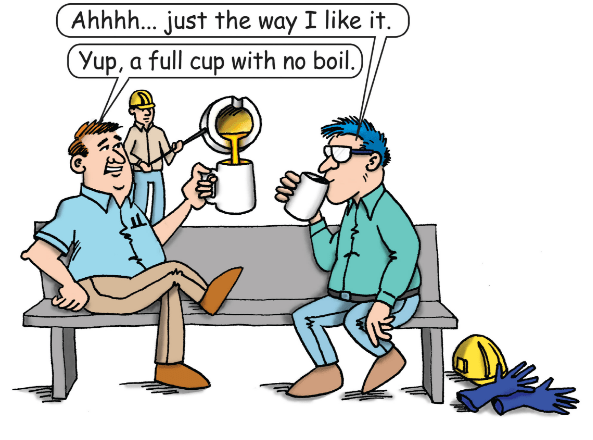 For an under-filled cup like it often happens with QuickCup, thermocouple is too close to the surface, causing the cooling rate to be too fast and the iron undercooled. This causes the liquidus value to be slightly off, giving you a small change in Carbon AND a 3-times larger change in Silicon. Depending on your thermal analysis system, the eutectic temperature may also be affected if the thermocouple is not centered due to a partially filled cup. Our studies have shown that a cup that spits iron out is usually only 70 to 80% full (go ahead like we did and weight 20 of your solidified QuickCup iron samples and see if they correspond to a full cup weight ; they won’t). Does your thermal analysis system depends on the cooling rate, which is the first derivative or on the second derivative, the strongest point of the cooling rate to measure the eutectic temperature ? For accuracy and reliability on your %C or microstructure control like nodularity and shrinkage tendency, you need a MeltLab system which can go up to the fifth derivative. Series of seven tests have been conducted . The goal was to compare results from QuickCup and MeltCup for iron chemistry ( cups with tellurium). Table 1 : Thermal analysis results for the experiment : the values indicate the average change from the QuickCup to the MeltCup. 1. The Max temperature is clearly higher due to the non-boil of the MeltCup and the difference in sand binding. 2. The liquidus was close and may have been affected by the amount of iron in the cup. 3. The eutectic is clearly different and is due to a loss of chemistry. 4. The Solidus is very close indicating that the thermocouples (wire) in the two style cups do match as this temperature is controlled by tramp elements and not carbon and silicon. 5. The C.E. is again very close. 6. The carbon in the MeltCup is significantly higher indicating a loss of chemistry in the Electronite cups’ boiling. The degree of loss can vary by time and temperature and state of the Electronite cups. The waterglass for tellurium additions in QuickCup is hydroscopic and will vary in moisture content depending on external conditions. 7. The silicon is off due to the difference in carbon. The equation used in thermal analysis is generally Si is proportional to (CE – C). The BCIRA organization uses a different equation that is silicon is a function of Liquidus and Eutectic. But as noted, the Eutectic is strongly affected by the boiling. 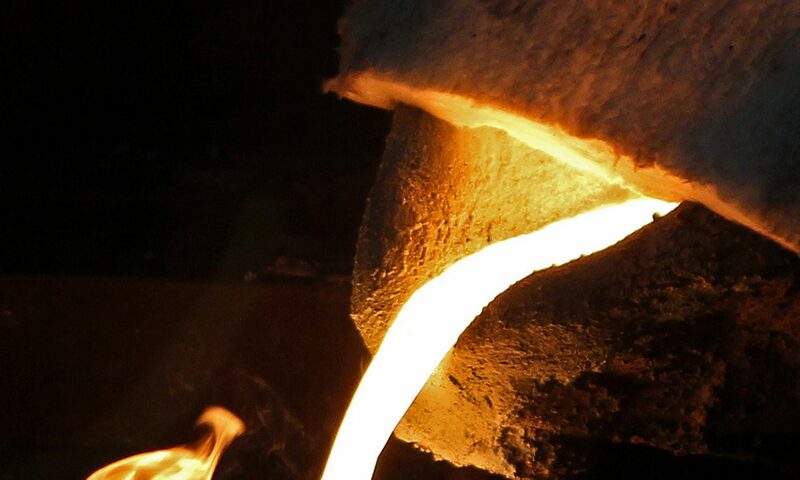 You don’t want to change your foundry’s chemistry by 9 points of carbon! But the instrument you have may have a correction factor within the instrument to make up for the loss of carbon in the analysis. Read just your thermal analysis instrument’s carbon to agree with combustion analysis and your thermal analysis instrument to agree with spectrometer silicon. Reliability, more accuracy, and ease of use are all benefits you will receive from using MeltCup. You will get fewer missed analyses, and won’t be affected by partially filled cups and loss of chemistry by boiling the iron in the cups. You will get less temperature loss which means it will be easier to get a sample from pouring lines and ladles. We also offer plain (non-tellurium) cups, and sulfur+tellurium cups. For 26 years now, we have offered the “Better thermal analysis instrument” – MeltLab. We are often imitated, but never matched. Our hardware is now warranted for 10 years as compared to our competition’s one year warranty. And since it is a PC software controlled system, you can easily upgrade it as times change. Next article on SF blog will be on our upcoming training on no-bake molding and a quick poll to ask you into which SF training topics your company is interested ( Foundries and Casting buyers ). We’ll also have a training on SOLIDCast, OPTICast and FLOWCast casting process simulation coming around March 2017 in Québec.